Coastal Resources O & M Manager Glen Johnson leads a tour of commercial haulers through Fiberight's Hampden facility. 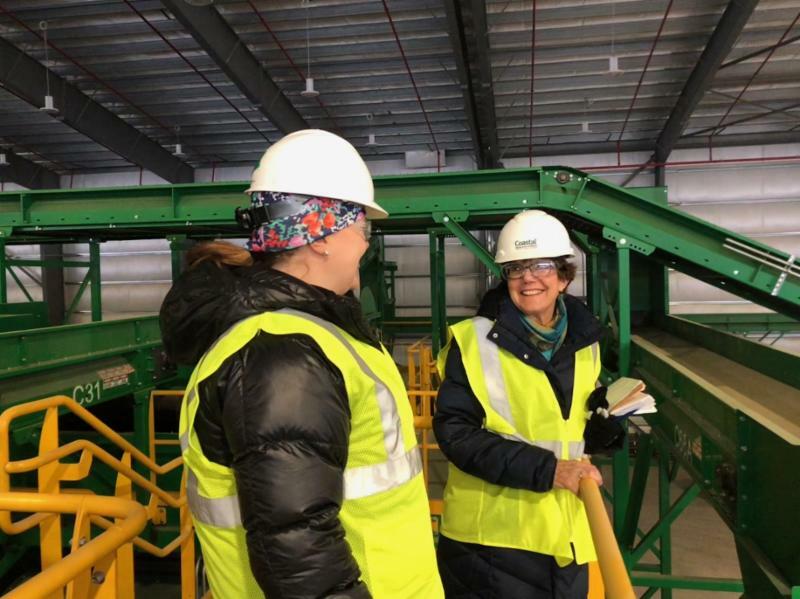 Coastal Resources will begin accepting single stream recycling (SSR) from Municipal Review Committee (MRC) communities that have executed contracts for services with the Hampden, ME facility in the coming weeks. 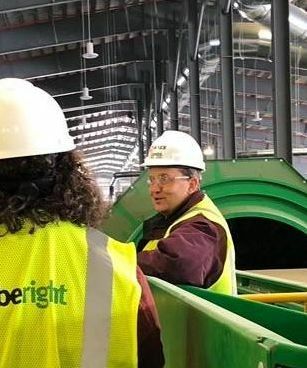 Fiberight and Coastal Resources officials have worked closely with the MRC to develop a methodology for ramp up starting with SSR in March and continuing with municipal solid waste (MSW) deliveries to the new facility. The onboarding plan for MSW encompasses a three month period set to begin in April. Because it is not possible to bring every community's waste in on Day One, MRC towns have been sorted into three (3) onboarding groups based on a variety of factors such as: transportation expenses, delivery methods, delivery schedules, geography, clear preference to avoid landfill, MSW tonnage generated per month, and the number of possible deliveries per week. Municipalities are being contacted by staff directly to discuss their individual onboarding scenarios in more detail. Note: MRC towns are not automatically contracted with Coastal Resources for SSR services, a contract must be executed with the facility prior to any town delivering single stream materials to the plant. If your town is a member of the MRC and you would like to contract with Coastal Resources for single stream recycling services, please contact Shelby for more information and/or to set up an appointment. Coastal Resources of Maine has a new website! CoastalResourcesME.com includes information about how the facility uses Fiberight technology to process household waste into value-added commodities, Coastal's hours of operation, recycling program options, and downloadable resources such as education and outreach materials for municipalities. Illustrations on CoastalResourcesME.com demonstrate the process stages for deconstructing the waste stream and creating value-added products from recovered materials. Coastal Resources welcomed Carol Woodcock, State Office Representative for Sen. Susan Collins to the facility in February . On Thursday, February 14th, Coastal Resources, in partnership with the Municipal Review Committee (MRC) and NAES hosted town officials and public works directors from MRC communities that manage residential curbside pick-up programs for municipal solid waste and recycling. The event also included several private haulers from around the state who provide transportation services for the pick up and delivery of materials bound for Coastal Resources. Over 30 representatives from interested parties met to gather feedback, exchange information about current local programs, discuss day to day operations and go over onboarding protocols being developed for the new solid waste and recycling processing facility. The morning workshop was followed by a private afternoon tour of the Hampden, ME plant. February's onboarding workshop follows the transfer station managers and operators event of the same format held in December. 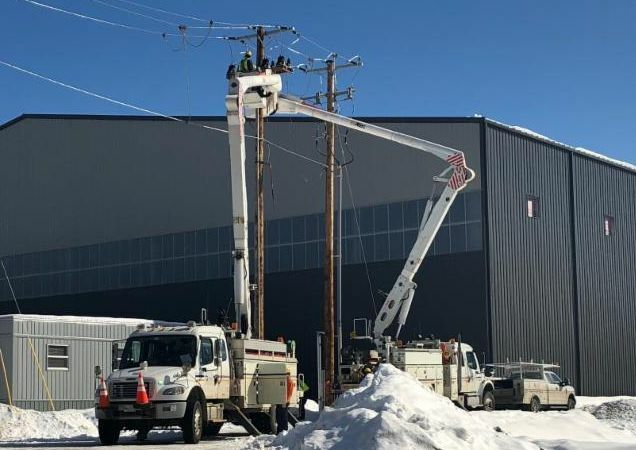 The NAES team, the independent services company contracted to operate and maintain the Coastal Resources facility, is busy preparing to be ready for commercial operations as soon as construction and commissioning is complete. We have ramped up the interviewing process and are close to bringing on more folks in readying the plant for start up. We are still taking applications for several positions at naes.com . The facility's first piece of heavy equipment - a CAT Loader will be arriving next week. The loader initially will be used to handle early single sort for commissioning ramp up and will be used mostly on the wet end of the plant for cellulose system feed and handling. The construction of the plant continues in high gear, and you can literally see great progress on a day to day basis when you walk the plant. 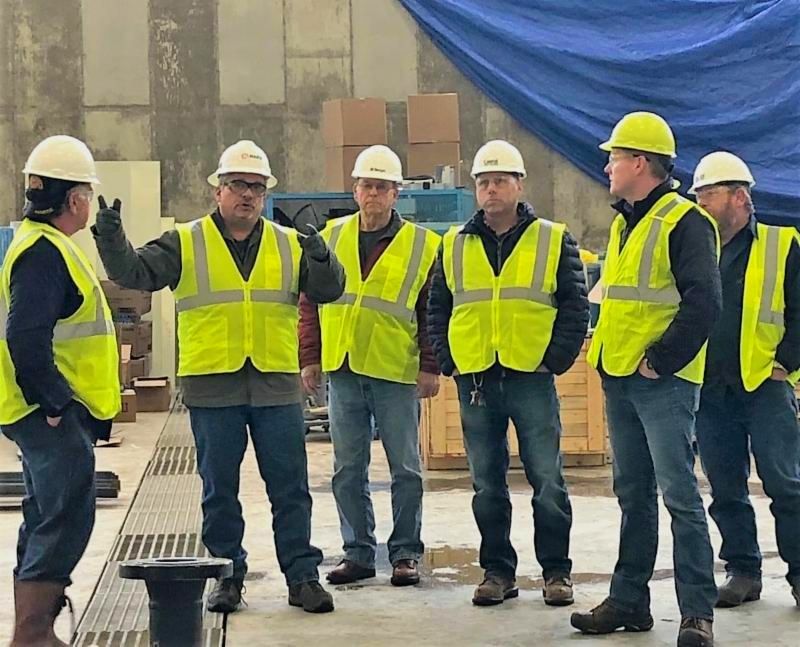 The men and women employed by the local contractors building the facility are working at an outstanding pace - a great example of the Maine work ethic! Lastly, we have been working diligently on finalizing purchasing agreements, logistical issues, software checkouts, and network infrastructure to insure a smooth transition to commercial operations. It is an extremely busy and exciting time at the CRM facility to say the least! Power and air systems to support the MRF commissioning will turn over to operations the end of next week. Primary power to site has been energized. Administration building was set and assembled. Early occupancy could be as soon as 3/15 to support operations training. Tipping floor is being set up to receive single stream in early March. Construction is on schedule per the system turnover plan published on February 8th. Grating and pipe shipments released a significant amount of work in the building for pipe and electrical trades. with the schedule for equipment, steel, and piping installations. 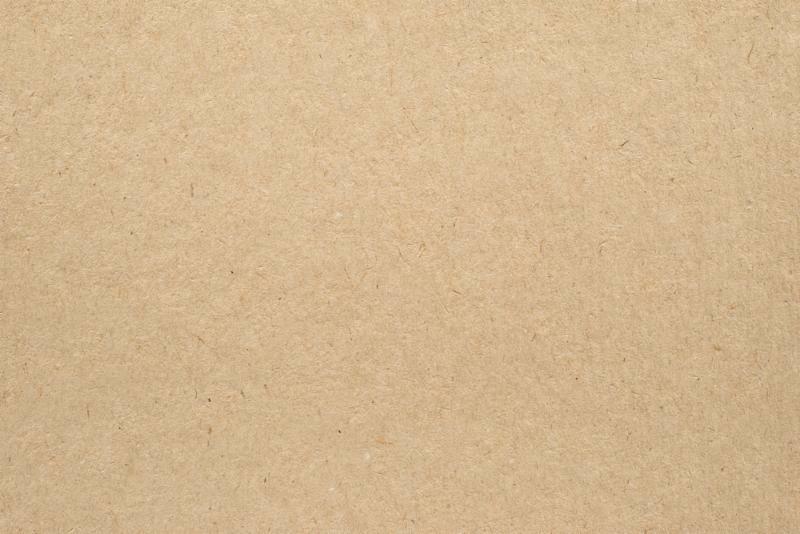 Single Stream Recycling contracts and guidelines are available to any MRC member communities that wish to consider contracting with Coastal Resources for recycling services. Tipping fee for single stream remains firm at 50% of MSW rate. Education and Outreach materials are in development. Contact Shelby @ 592-6432 with questions or to set up a meeting to contract with CRM for services. While the Coastal facility will accept textiles disposed of in normal household waste, Fiberight/Coastal Resources continues to work with Apparel Impact to expand textile recycling options throughout our member communities. If you'd like to know more about getting a clothing collection bin in your area, please contact Shelby. MRC community and facility site visits are ongoing with the goal of visiting every partner facility. Want to schedule a visit? Let us know. Contact Shelby at swright@fiberight.com or 207-592-6432 for more information about any of the topics contained in this update.